US President Barack Obama’s visit to South Africa will help strengthen ties between the two countries, President Jacob Zuma said on Monday. “This will present an opportunity to showcase progress since the establishment of the African Union, and to discuss co-operation on matters of socio-economic development, as well as peace and security on the continent,” President Zuma said in Johannesburg. President Obama is due to arrive in South Africa on Friday. 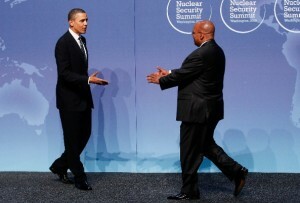 Zuma said about 90 per cent of South African exports to the US entered that country duty-free. The visit would further strengthen US-SA dialogue on areas including health, education, agriculture, trade, investment, energy, he said. “Democracy-building” is key to the US initiatives in Africa, deputy National Security Advisor Ben Rhodes, asserted on Friday. “So trade and investment and the economic opportunities on the continent are going to be an important part of the agenda; also democracy and democratic institution-building,” Rhodes said. From 2000 to 2010, six of the 10 fastest-growing economies in the world were in Africa. The International Monetary Fund (IMF) forecasts that the number will increase to seven in 10 in the first half of this decade. “President Obama will talk about the American investments for African economies and people across the board,” said US senior director for African affairs, Grant Harris last weekend. Meanwhile, a coalition of nine organisations, led by the Congress of South African Trade Unions (Cosatu) and the South African Communist Party (SACP) are protesting against the US President’s visit. “Friendship with South Africa must be based on valued justice, freedom and equality and these the US has offended, undermined and ridiculed through its actions in the global front,” said Cosatu Gauteng chairman Phutas Tseki. US economic sanctions on Cuba, failure by the US to act on climate change and the continued existence of the Guantanamo Bay prison have been cited as reasons for their protest by the group. President Obama is visiting Senegal, South Africa, and Tanzania from June 26 to July 3.